HealthCentral has received questions about this particular disorder from harried caregivers who want to provide the best care possible for their loved ones who have this disorder, but find it difficult to locate information about how to prepare food so it that looks appetizing and tastes good. This is where groundbreaker Diane Wolff’s company Essential Puree comes in to play. HealthCentral discovered that Wolff provides actual recipe books (both ebook and paperback) that can prove invaluable to the cook who must switch to purees for their loved one. Essential Puree has been given the Friendly Caregiver Award from Today’s Caregiver magazine. Wolff has done lecture demonstrations and tastings at the Fawcett Memorial Hospital and Bayfront Medical Centers, as well as the God's Love We Deliver charity in New York. Essential Puree is listed on the reading list for Culinary Nutrition at Life University in Marietta Georgia and are is used by the Florida Cancer Institutes. The company is part of the Swallow Support Groups at the University of Washington and is recommended by Dr. Manuel Martinez of Millennium Physicians and Dr. Amy Mellor, neurologist, both in Port Charlotte, Florida. Wolff has been featured for National Dysphagia Awareness Month on the website of the National Foundation of Swallowing Disorders. More about her impressive biography can be found on www.dianewolff.com. For this article, Wolff not only answers questions for HealthCentral, but also provides two recipes and the web address for several free downloads. HealthCentral: Diane, how did you get started with your passion for helping people with dysphagia maintain nutrition and still enjoy their food? Diane Wolff: I am an author and journalist and have traveled all over the world in search of great stories, but I gave up the writing life to take care of my mother. I had been cooking for my mom for two years when she was diagnosed with dysphagia, a swallowing disorder. I could not find the book of practical advice that I was looking for, so I wrote the book that I wished that I had when my mom was diagnosed. HC: Please tell us about your first book. DW: My first book was The A to Z Guidebook, which presents a system for setup and running of the puree kitchen. In it, I discuss kitchen tools and instant thickening. I tell how to stock the pantry, the refrigerator, and the freezer. I explain how to cook in batches so you cook once and serve four to six times. I tell how to label and store food and I include dishes that were family favorites, recipes handed down for generations. HC: What other books do you have to offer? DW: The Essential Puree Library includes: The Purees of Summer: Safe Grilling for the Cookout; The Purees of Fall: The Holiday Meal; The Purees of Fall: Game Day; Betsy’s Mom Was Diagnosed and Betsy Has a Full-time Job (or How to Get a Meal on the Table In Fifteen Minutes When You Cannot Cook); Shake, Rattle and Roll: Nutritionally Dense Shakes (free download from www.essentialpuree.com); The Science of Puree (free download); Kitchen Tools (also a free download). To my knowledge, the Essential Puree Library is the only collection of volumes in the world dedicated to the condition of dysphagia. All books and eBooks are available on the Essential Puree website www.essentialpuree.com. HC: You are generous with your free downloads, Diane. That’s going to be appreciated by HealthCentral’s readers, I know. DW: I’m happy to provide free downloads and give away some recipes because of my passion for this topic. I’ve been where your caregivers are and I know how hard it is. This is my way of helping out. HC: What is on the horizon for your recipe collection? DW: We will be launching Essential Puree Frozen Desserts, which contains recipes for delicious pureed cakes and pies, later this year (Most dysphagia patients have only thickened ice cream and pudding). My mom had a sweet tooth. She wanted cake and pie. Essential Puree Desserts was born. Go to the website and sign up if you want to be on the mailing list! HC: OK, Diane. Here is what many have waited for — your recipes that make food interesting even if it must be pureed. We thank you for these. This is an uncooked soup, really a salad in a bowl. The recipe was taught to the Spanish by the Romans who incorporated Spain into the Roman Empire. 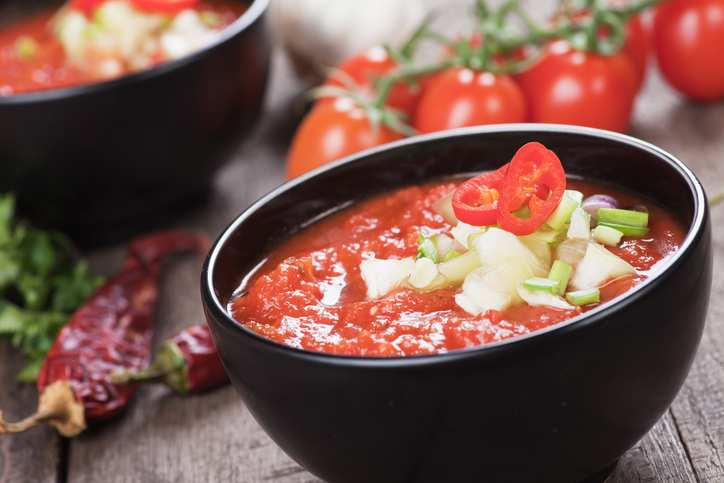 Gazpacho is served chilled, slightly cooler than room temperature. The dysphagia patient cannot tolerate very cold foods. For maximum flavor, I marinate the veggies. If you are short of time, you can skip the marinating. Please make sure that your loved one can eat raw veggies. A good blender with a flat bottom is best. The Ninja works well. Directions: Whisk together the oil and vinegar, salt and pepper, add the cut up veggies and marinate them for at least an hour in the fridge. This creates maximum flavor. Blend the veggies using the vegetable juice as needed to get the soup smooth. The celery will be rendered into a puree. If there are any strings from the celery, push the finished gazpacho through a mesh sieve with a silicone spatula to remove strings. Begin on a low puree, pulsing for ten seconds to chop the vegetables, then puree for twenty seconds or until smooth. (The veggies make a thick puree when using a high-speed blender.) Puree should be smooth with no pieces of fiber or skin. To thicken: Add a scoop of gel or powder thickener, as the manufacturer instructs, for a six ounce serving of soup. Any of the commercial thickening agents will work. Simply Thick, gel or powder, is my favorite. Puree for 10 seconds. Refrigerate to make sure soup is chilled and at its peak of thickness. Do not chill too much, as very cold foods are not desirable for the patient with swallowing difficulties. 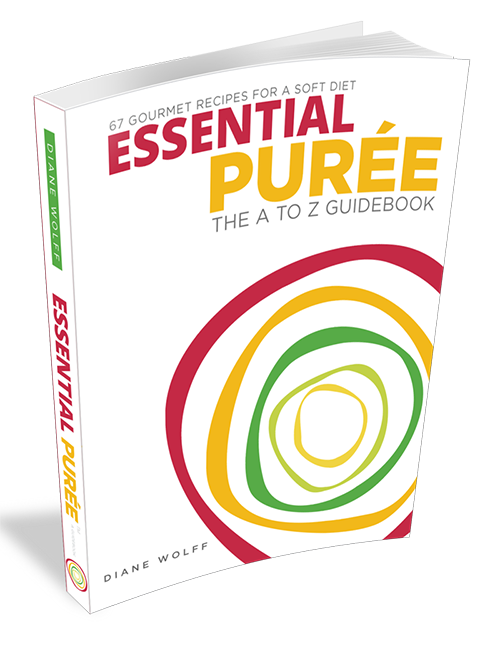 For complete discussion of instant thickeners, get the free download “The Science of Puree” from www.essentialpureel.com. This gazpacho can be turned into a lunch with the addition of protein. Add one sliced hard-boiled egg. For vegetarian protein, add 8 oz. of silken tofu, cubed. Tip: If you do not have good fresh tomatoes on hand, good canned and diced tomatoes will work, as they are picked at the peak of freshness and have good flavor. Organic, if possible, for clean eating. Tip: For extra flavor, add a tablespoon of a good mild salsa, your favorite brand, to the puree. Common sense should prevail here. DO NOT add tabasco sauce, a traditional accompaniment to gazpacho, because it is not safe for the swallow. You do not want the person with a swallowing disorder to aspirate because of the heat. Previously the person with swallowing disorders might have been discouraged when the family and friends enjoy the classic items of the summer cookout — burgers and dogs. With the right tools and the right technique, the dysphagia kitchen may include the iconic dishes of summer, plus the classic sides. It is all a matter of the right equipment — the indoor electric grill and the high-powered buzz of the nutrition extractor. Cooking technique: Gently grill, low and slow without a lot of charring. The flavors develop but the puree is safe for the swallow. It is better to tweak the dish than not to have the dish at all. I use the example of a beef burger, but any burger will do —chicken, turkey, salmon, veggie, or black bean. If you like to cook, by all means, mix up your favorite burger recipe and grill it low and slow, cooking it thoroughly. Season with salt and white pepper. Black pepper has large particles and is not safe for the swallow. Once the dish is pureed, if there are larger particles than are recommended, run the puree through a mesh sieve with a silicone spatula. The recipe calls for two burgers because one needs enough of the dish to fill the bowl of a mini food processor for maximum efficiency in operating the processor to get the best puree. If you are working with a Ninja, the blender has a double tier of blades. You need enough ingredient to get the blender to work. The same is true of the NutriBullet nutrition extractor. Prepare the burgers according to package directions, on the grill or in a skillet on the grill or stove. Remove to a plate and allow to cool. Break up the cooked burgers and add them to the bowl of a mini food processor, the pitcher of a double-bladed blender, or a nutrition extractor. Pulse ten times to break down the burgers. At this point, condiments may be added to puree. At the end: Add a teaspoon of instant thickener to bind the puree. The brands of xanthum gum thickeners are ThickenUp Clear, Thick and Easy Clear and Simply Thick. After the 10 pulses combine the thickener with the burger, wait a minute and allow the dish to set. Swirl Away! For a complete explanation of Instant Thickeners, get the eBook The Science of Puree. This is a free download from the Essential Puree Bookstore. www.essentialpuree.com. As always, check with your health care professional. HC: Thank you, Diane, for this huge contribution to the caregivers and those they provide care for. Pureed food is a topic that most people don’t even like to think about. You make it sound like a delicious alternative to a regular diet. We appreciate your generosity. HELP! Why Can't I Swallow?